Has Edward G. Robinson ever performed badly in a film? I don’t think the possibility was in his DNA. He is one of the most reliable stars of the studio age, making classics sing and elevating lesser films with an inborn understanding for character and performance. In a pair of films now available on Blu-ray from Warner Archive, the actor demonstrates how his style evolved as Hollywood moved into the age of television. 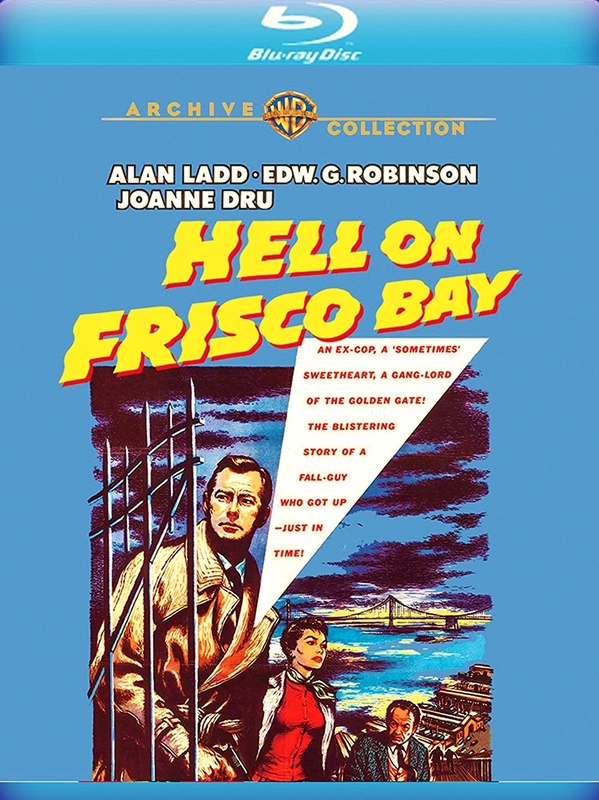 Hell on Frisco Bay (1955) stars Alan Ladd, though Robinson’s impact is such that the true matter of top billing can become confused. The film is a production of Ladd’s company Jaguar, which had a distribution deal with Warner Bros. Filmed in Warnercolor and Cinemascope, it is engineered to draw audiences away from their television sets, but in every other way this is a straight ahead noir production. Ladd is an ex-con, ex-cop who has just left prison after serving time for a crime for which he was framed. Set on revenge and scornful of his unfaithful nightclub chanteuse wife (Joanne Dru), he takes no joy from his release. Robinson is the brutal mobster in his cross hairs. It is the performances, and the sharpness of the color cinematography that give this San Francisco-set noir its power. One can never have enough William Demarest, and as Ladd’s ex-partner he doesn’t have enough to do, but he is a welcome presence for his brief scenes. As Robinson’s henchman, Paul Stewart is subtle, rather than sniveling, in his portrayal of a weak willed man who is destructive because he lacks the courage to act. As she tended to do in her later roles, Fay Wray plays Stewart’s ex-film star girlfriend with the wounded dignity and frustration of a woman who knows she is above it all and is waiting for the rest of the world to catch on. In her one extended scene, she gives Stewart a hard look, asking him for strength that he doesn’t have and in that brief moment you know all about her troubles. While he has a lot to contend with as co-star with Robinson, Ladd is a fascinating tough guy. There have never been enough action heroes of short stature in the movies, which is a shame. There’s something explosive about a man who doesn’t lean on physical appearance to make an impact. His strength is in his focus and physical skill, which are much more exciting to watch than a towering man who seems to have the deck stacked in his favor. Robinson dominates the film though, as he can’t seem to help doing. It’s terrifying the way he holds his victims in a seductive viper’s gaze, head still, eyes focused, often with only his jaw in motion, working the nerves with a barrage of abuse. He had great control of his body, like a trained dancer. There’s no wasted movement and he never flails, lashing out like a viper with surgical precision when he needs to make a point. Ladd has some of these qualities as well, but he’s got an icier core. 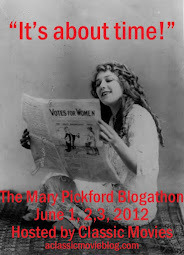 You can imagine Robinson relishing a good meal; Ladd seems empty of that kind of capacity for pleasure. Keep your eyes open for a brief Jayne Mansfield cameo in a nightclub scene. While Hell on Frisco Bay is an enjoyable crime flick, The Sea Wolf (1941) is a tightly-wounded Warner-style masterpiece. It has everything that made the studio great: powerful, charismatic stars, gritty atmosphere and brisk pacing. 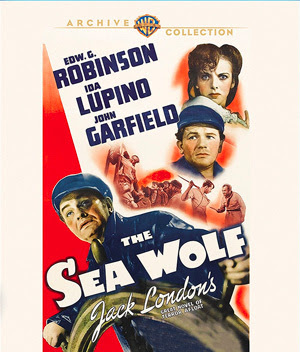 Set on a ship with a rogue captain (Robinson) and a crew mostly unaware of the danger it faces, this adaptation of Jack London’s The Sea Hawk (the name was changed to avoid clashing with Errol Flynn’s action flick of the same name) has that pulsing feeling of dread in found in other sea classics like The Ghost Ship (1943) and Mutiny on the Bounty (1935). Much like the former film, the ship here often has the shadowy, misty look of a haunted house, foreshadowing the increasingly less mysterious evil at play on board. With intense leads like Edward G. Robinson, John Garfield and Ida Lupino, it’s a wonder The Sea Wolf doesn’t explode from the tension. There are many spurts of action throughout the film, but it’s just as exciting to watch Lupino and Garfield have a quiet conversation or listen to Robinson discuss poetry. Whatever the tone of the scene, these three demand your attention in a strikingly visceral way. The supporting cast is also uniformly solid. Barry Fitzgerald provides a hint of levity as the cook. As the ship’s doctor, Gene Lockhart also stands out; he’s a broken man who is painfully aware of what a sleazy enterprise he supports. In an early role, Howard Da Silva begins to develop that smooth voice which would eventually be such a slippery delight in crime films to come. As a reassuringly bland writer who is dragged onto the ship with Lupino, Alexander Knox provides some relief from the tightly-wound style of the leads and ship’s crew. It’s a great ensemble effort, perfectly executed and beautifully paced. This breathless thriller is worthy of classic status. This release is especially important because it is the first time since the film's release that the full original cut has been available. It was cut by several minutes for its re-release in 1949 and seeing the complete film, I am glad that Warners held off on this Blu-ray debut until that footage was restored.